Solicitors from Hell - a genuine customer service, a scam or absolute b**ll**ks?
" Unfortunately we have only just heard about this site, had we had a chance to do a check on him prior it would have saved a great deal of upset and stress. My female cousin went to see this ‘solicitor’ with housing problems. At the initial consultation he was extremely friendly – actually overly so when his secretary went out of the room. He asked many personal questions that were not actually relevant to the case in question and gave out information about what he had allegedly done to help other clients. He kept going on about her being a young vulnerable woman and stated that he was going to take several actions on her behalf as she was being harassed by the landlord. However as my cousin felt uncomfortable seeing him alone she asked me to come to the next meeting. When he saw that she was accompanied by a male family member, he was abrupt and tried to give the impression that he had not really wanted to take her on as a client in the first instance. He stated that she did not need the help of a solicitor – however this had not stopped him from applying for and receiving the legal aid to progress her case. He wrote a long letter of summery allegedly to explain ‘why’ she did not need his help - which was actually more like a personal tirade against his own client and told her to make a complaint if she felt she had the strength! It was then difficult to find another solicitor to transfer the LSF to; luckily the solicitor my cousin then found was extremely professional, helpful and progressed a speedy resolution on her behalf. Only use this firm if you want to be disappointed and put under stress. Not to be trusted!! " I am not quite sure what the complainant's complaint is having read it through a few times - is it that the solicitor was not only from hell but also a bit of a creep? Was the solicitor trying to defraud the LSC? Does this feedback assist anyone in deciding whether to hire this firm of solicitors or not? The service obviously provides a genuine service when you get a firm like SMK Solicitors, who are now shut down due to a range of problems and have been intervened. A site with feedback detailing the potential fraud that a client experienced would be helpful for anyone else to know to avoid it. "I worked at X (thankfully not for long). A good example of the way the firm operates is when I was told to create as much conflict as possible in child contact cases in order to maximise costs. This firm definitely needs some intervention from the Law Society. The Senior Partners are a joke and would not survive in a modern law firm. It is true, they are fascist bullies. Oh, and where I work now, I am allowed to make myself a cup of coffee! " This sort of entry could be put down to a former employee airing a grievance and trying to get one over on the firm. They have certainly done this. The firm in question obviously now have anyone thinking of instructing them and reading this that the staff do not like working there, the firm is bent, the partners not very nice. It could damage that firm's reputation forever. I certainly had no idea that the firm were thought of in this way, and we introduced one of the partners mentioned to the firm many years ago! I understand that unless a law firm pays an "administration fee" of £200 then the entry remains on the site for eternity. This means that anyone searching for the law firm will inevitably come across comments like this one. Think of the black hat marketing potential of this site. Any law firm in Swindon for example could post anonymous comments onto the site for their competitors and sit back and watch their instructions increase. Obviously this comment is intended as irony....(before we get sued!). So in summary I am afraid we think that the site is b**ll**ks. There has been no effort to identify the posters, and this makes the site positively evil as it could unfairly irreparably damage someone's reputation who does not deserve it. I hope the owner of the site sees some sense or gets tired of receiving writs in the post and takes it down or identifies each complainant. I think that without any control this site is simply destroying law firms very unfairly indeed. We are starting to take calls on a regular basis from firms not knowing what the current position is in relation to the duty solicitor rotas. 2. The LSC are apparently considering breaking the contract halfway, but in the meantime no firms are allowed to make applications for new geographic areas. We are not entirely sure how true this will be, as the LSC seem very good at changing the goalposts every few minutes, but in terms of recruitment plans we thought this may assist. It does mean as far as we can see that no firms will gain new slots outside their own geographic areas by setting up offices or taking on staff in other locations. The benefit in recruiting duty solicitors appears to be that the slots on each rota are awarded according to the number of duty solicitors a firm has at the time the rota is drawn up. If you are considering recruiting before the next CDS 12 deadline it is probably worth registering the vacancy with us now if you have not been in touch with us already. We have over 300 duty solicitors registered, on a passive and active basis. We can also offer you the Ten-Percent Unlimited Service to cover your recruitment over the next 12 months for a one-off fee. 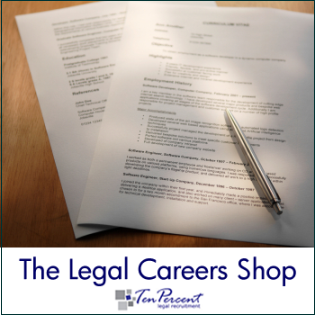 To register a vacancy simply reply to this email with a quick description - salary or percentage, full/part time, level of experience, whether you will consider taking a non-duty police station accredited solicitor and whether you have a cap on duty solicitor salaries - eg £38k. You can also visit our website at www.ten-percent.co.uk/er.html and fill out our online form or search our candidate database. If you would like any further information regarding our services or would like to register a vacancy with us please get in touch. When a new employee starts a job there is almost always some element of nervousness and hesitancy from both sides, the existing staff and the new member of staff. Here are five ways to make the first day considerably easier. 1. Organise a lunch out for all the staff (presuming this is a small firm obviously!) including the new employee. Make sure there is no alcohol served during this meal. 2. Make sure you have some work available for the new employee when they start. There is nothing worse than joining a new firm and finding that you are sat there twiddling your thumbs. 3. Give the new employee an induction into the workings of the firm but make sure this induction is not an excuse for your HR Manager to wander off for two days and not do any work. The induction should be as short as it needs to be. 4. Give the new employee their Contract of Employment and staff handbook etc. For a free Staff Handbook Download please visit http://www.businessbusstop.com and follow the link to “free resources”. 5. Be nice to the new employee as they are going to be a valuable and worthy member of your team. It has probably cost you considerable time and effort to get the person in and there is often complacency amongst employers once a new member of staff joins with almost an assumption that you no longer need to do anything for them.